Google Chrome is the fastest browser in all aspect like browsing, downloading, streaming and much more, sometimes you may get an error that Google Chrome won’t open at all, no matter how many times you try to open it but nothing happens. Whatever you tried to fix this issue but nothing worked properly, chrome isn’t launching makes you go crazy you don’t want to use other browsers because chrome has your installed extension, bookmarks and saved passwords. One can also import these browsing data but once you love chrome you can’t leave it. What Steps you have taken to Fix Chrome error? Killing Chrome process from task manager ( If this Just happened). Why Google Chrome Won’t Open? If you have gone through all the above steps but still chrome is unable to start this means your chrome is affected by some malware or there is a program which is stopping chrome to be launch this may be due to Antivirus, 3rd Party Firewall, Firewall installed by Antivirus OR you have installed such program which is causing problem with it, basically in such case the Ownership of chrome got changed and you can’t start it from your user account. 1. 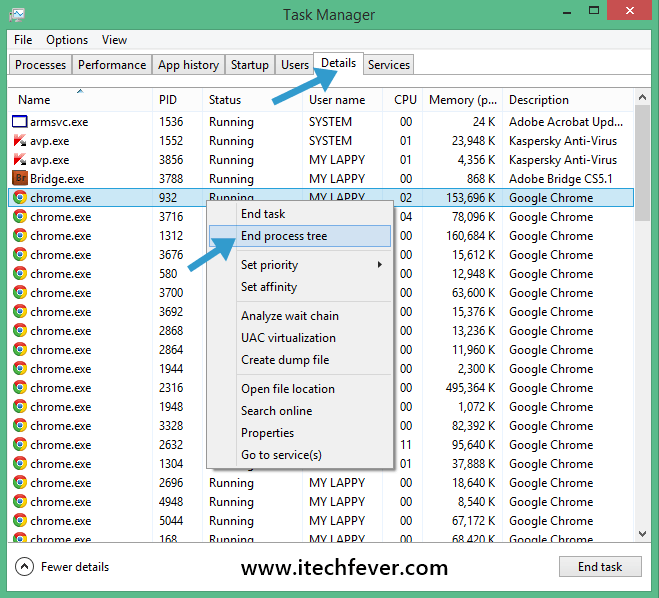 Kill the Chrome Process from Task manager – Open Task Manager and Kill Every process of Google Chrome. 2. Reboot Your Computer and check again. 3. If your computer has another user account then log on to that account and check whether it is working or not, if chrome is working on another user account then first user account got affected, If it doesn’t work on any user account then chrome got affected for all users. If all above tries couldn’t resolve this error then before Resetting Chrome or Re-installing it (This may also not work) try this final Fix it will surely resolve this issue. C:\Program Files\Google\Chrome\Application If it is 32 bit OS. Check whether you have 32 or 64 bit OS. OR – Just Right click on Google Chrome shortcut and open file location. 3. Right Click on New Shortcut and Go to Properties. 4. Go to Security tab. 6. Once you click on the Advanced option you will get another window named as Advanced Security Settings. Here Click on Change Option. 7. After Clicking on Change in owner section, you will get another window to Select User or Group, In the Box below type your USER NAME (Mine is My Lappy) and Click on Check Names it will turn to COMPUTER NAME/USER NAME (Mine is like SANDEEP/MY LAPPY) and Click on OK.
8. Now Go to Effective Access Tab in Advanced Security Settings, and Click on Select a User. 9. 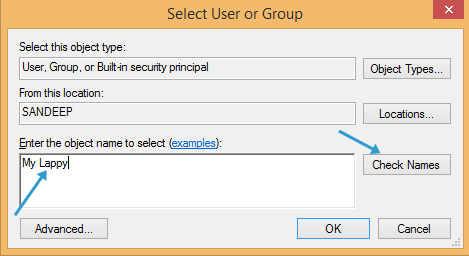 After clicking on Select a user same window of user or group will appear again, type USER name and Click on Check Names again. 10. Hit OK to it. 11. Hit Apply / OK on Advance Security Settings Window. Hit Apply / OK on Chrome Shortcut – Properties Window. Means Save all changes you made. Now open Google chrome it will open and work properly if not then restart your computer and check. Delete the older shortcut of chrome from Start menu, Taskbar and Replace with Modified one. After following the above steps, you will be able to fix google chrome won’t open error and Google Chrome will open quickly and it will work as usual. One of the best features of Google Chrome is that it updates itself in the background without any prompt, sometimes a problem occurs when chrome trying to update from one version to another, and the update fails which leaves chrome in an unstable state. As you can see in above image that chrome has 2 versions into the Application folder 47.0.2526.111 is the older version and 48.0.2564.116 is the latest version. Open the newer version’s folder and copy all the subfolders & files and paste them into older version’s folder. Try to open Google Chrome now. Thanks to Eric Schmidt for this fix, Chrome.dll is a file which contains the various setting for the chrome browser if chrome isn’t opening then delete this chrome.dll file from application folder. Open C:\Program Files (x86)\Google\Chrome\Application then open chrome version folder, find and delete chrome.dll. Deleting this DLL file removes all the older settings of google chrome. This solution also worked for many users. If you have upgraded your Windows PC from Windows 7, 8.1 to Windows 10 then you may face chrome not opening issue. After upgrade Chrome will not open due to Microsoft’s installer automatic settings. This installer will set Chrome’s execution mode for Windows 7 or Windows 8 compatibility. To Fix the Compatibility issue after an upgrade you need to change the compatibility settings. 1. Locate Chrome shortcut on the desktop. (If you don’t have chrome shortcut on the desktop then make it). 2. RIght click on the Shortcut and Click Properties then select the Compatibility tab. 3. Uncheck the box which says ” Run this program in compatibility mode“, then hit Apply and OK.
Now check if the Google Chrome is working or not. Download Chrome Cleanup Tool using a different browser (obviously) and locate the downloaded program and double-click to open it. This program won’t install to your computer, it is a flash scanner to find suspicious programs and to reset Google Chrome Settings. Clean up tool will scan for conflicting program, if it does find any such program then it is recommended to uninstall those program. If it does not find suspicious program then click on Continue. Reboot your computer and check if it is working or not. Sometimes your Antivirus and Firewall may block certain actions to be taken by computer. If you have an antivirus program installed then try to turn it off temporarily and check if you are able to open Google Chrome. 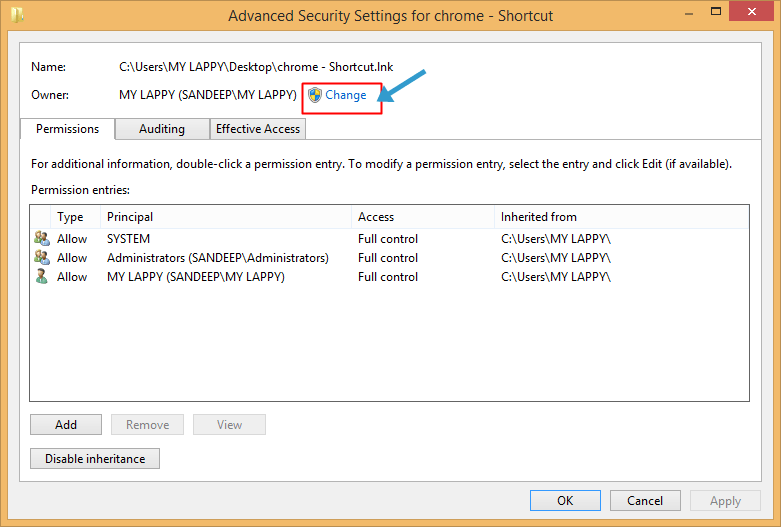 Create an exception to the Firewall setting for Google Chrome. Open Windows Firewall from the control panel and Click Allow an App through Windows Firewall. Now browser the Chrome.exe from C:\Program Files\Chrome\Application and add the exception. Check the Private option for Chrome.exe. An answer by Google Expert suggests that if Google Chrome is unable to open and won’t give any error message then you may have broken user profile. You need to create a new user profile in order to get your Chrome working again. Press Win+R key on your keyboard and type %localappdata% then hit OK. It will take you to the AppData folder navigate to Google\Chrome\Userdata. Now, Restart your PC without any try to open Google Chrome. Once restarted try to open Chrome and check if it is working. At this point, Chrome will create a new User Profile Named “Default” with new settings. If you have trouble fixing corrupt User Profile, Check this Article to Reset Chrome Where I have written the detailed procedure. This issue with chrome may occur on Mac OS as well, this fix works with all the major version of macOS like Mavericks, Yosemite, El Capitan, Sierra, High Sierra, and Mojave. Restarting chrome may fix this issue. If your chrome is unable to open at all then you need to get the permission for your account(Admin). If admin account has no access to read and write data on chrome then you won’t be able to open it. 1. Open finder and press Command + Shift + G Keys together. It will launch the file browser and /Library written by default, just press the Go button. 2. You will get many folders there, look for Google folder, right click on it and Click Get Info. 3. From the bottom of this window click on the lock icon and provide your password to unlock the settings. 4. Now click + to add the new user, from the prompt select Administrator. 5. Now you would find admin under the name, from the privilege section change the Read-only to Read & Write. Now close the window and try to open chrome, it should launch the chrome without any issue. If the above fix does not work by any chance, then you can try to reset the chrome. To reset chrome all you need to do is to delete the Chrome folder from Library. Now download and install a fresh Google Chrome, the new chrome should work. All the above-mentioned methods helped thousands of users to fix the Chrome opening issue, you need to try different fixes for your computer, any of the above fixes may work for you. Since this happens due to malware attack it is advised to run a malware scan using good antivirus like Hitman Pro, check your system type, download and install Hitman Pro accordingly it will quickly scan critical area and delete found malware, this antivirus comes free for first 30 days with full access, you only need to register for it using your email. Always install a good antivirus program like McAfee Total Protection to avoid any such issue in the future, having a full version of an antivirus give you a peace of mind and protect your PC from the different type of malware and also offers internet security. Or you can also go for free antivirus, these free antivirus programs provide you with essential security from numerous PC threats. Let me know which fix worked for you, if you face any trouble during all the above solutions then comment below. After a restore point I could no longer open, install or uninstall chrome. I had tried this whole list but no success at all to me. Finally, I did something risky and it worked. I don´t know if it is correct, but I deleted the chrome folder and it allowed me to install the program again. It worked fine keeping all my settings. Thank you for that suggestion. That worked for me as well and was much easier and less time consuming than what was suggested on this page. OMG, Thank you so much Sandeep, I was banging my head on wall, your final fix did the job. Nothing you suggested has worked. If you have not tried already turn off your firewall and antivirus. Although not a permanent solution, it will at least give clue on what is wrong. Well, I tried everything suggested plus the advice you gave to “dd” and my chrome still will not launch at all. I used IObit uninstaller and still no go. Any other ideas?? Will system logs tell me anything if it is another program that is stopping it? Annoying share buttons on the left side covering the text… Not everyone likes having browsers set to maximum.. And yeah my chrome won’t launch.. no solutions on this page though. Thank you for the feedback, I’ll improve it. Above is all solution I found till now, you can do a full uninstall like removing every trace of Google chrome files, registry entries, and policies. You can do it using Revo or Iobit uninstaller then reboot the PC and try to install it again. Also, let me know if it works or not. there are no files in my chrome at all it also has always been default browser im tring to download a program an keep getting a sorry …. ive tried fixing this for weeks thru the new program im tring to download they now say its chrome not them!! please help i dont have any of the things in the above troubleshoot ive checked. but oddly for a empty file it wont delete to reinstall? please help?? You have to completely remove chrome even from the registry and then re-install it again, to remove all the files use iobit uninstaller or Revo uninstaller. All I had to do was change compatibility to Windows Vista and she works like a champ. Thanks a lot for your advice! I have been trying everything, nothing helped. Your simple advice solved the problem. It is great! Thank you so much for your informative WebSite and Information as pertains to How to Fix Chrome Load Error. What worked for me was your tip about running the malware antivirus Hitman Pro. Ir worked and identified and repaired (removed) the Invalid Protocol which was preventing my Re installation of Google Chrome Web Browser. Did I say Thank you…..I spent hours on this last evening and then researched further and read your information…tried it and it FIXED my problem. If Chrome doesn’t open after windows 10 update, it could be because C drive is read only. Right click Google folder in Program files and change permissions for user groups. Or Install chrome in another drive and run chrome.exe from there. I tried pasting the new update folder into the old update folder and deleted the chrome.dll…… It worked! Thanks! I am with Shady. None of the above fixes work. then after uninstalling and reinstall again, it opens but appears as brown window with no tabs or anything else. I’ve tried all the above but nothing has worked with me. so what shall I do with this?